WARNING: You are already subscribed to Dinar Guru! Add my email address to your email address book. If you have not gotten mail from me, check your spam box and "promotions" box. It's important that you do that so you don't miss critical alerts and updates. Now onto something more fun...I want to answer your deepest burning dinar questions...and extended this offer to you...again since you're still a new member...read below for the full scoop! You have less than 30 minutes to claim your new member savings. Act Now to take advantage of this exclusive offer. 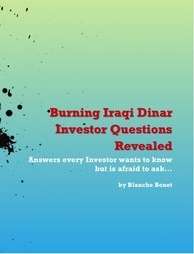 Receive "Top Iraqi Dinar Investor Questions Revealed & Answered" special report UPDATED EDITION for only $35.25. Once the offer expires the price returns to $47.95. As I write this I did a little math (dangerous I know! :) and I realized if you read the report over the coarse of the next month...you essentially get this entire Special Report for less than $1.57 a day! That's kind of like hiring my Iraqi Dinar mega brain for "sweat shop wages". The value of these bonuses is $95.90 by themselves...not to mention all the time, frustration and hassle they are going to save you. 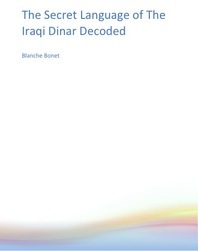 You'll have a whole new grasp and understanding of the Iraqi Dinar after reading this....I know I did. Oh, one more thing...As you know, I stand behind everything I do...If you don't like this for any reason and feel this is not for you simply let me know. (blanchebonet@gmail.com). I'll return your money no questions asked...100% guaranteed. This makes this super Easy. Keep all the bonuses as my gift for trying out the special report and we'll part as friends...no biggie. 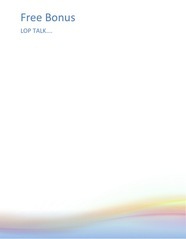 After you click the button go ahead and enter your Paypal information...you'll get instant access to All Three of Your Reports--the Full Q and A Special Report UPDATED EDITION, The Secret Language of The Dinar Free Bonus 1 and LOP talk Free Bonus 2! ©Copyright 2014, Dinar Guru, All Rights Reserved. All emails and correspondence sent to Dinar Guru become the exclusive property of Dinar Guru. By reading this, you agree to all of the following: You understand this to be an expression of opinions and entertainment and not professional advice. You are solely responsible for the use of any content and hold Dinar Guru and all members and affiliates harmless in any event or claim.